WELBRO Building Corporation completed a new Marriott International, Inc. dual-branded hotel near the Mall at Millenia in March 2018. The project combined 134 SpringHill Suites® by Marriott guest units and 120 Residence Inn® by Marriott guest units into one hotel. The hotels share a lobby, lounge, event space, state-of-the-art fitness center, pool, and pool bar. The SpringHill Suites rooms consist of large suites with separate living and sleeping areas, newly designed case goods featuring custom items from West Elm®, a dry bar with a refrigerator and microwave, USB ports strategically built-in throughout the suites, and spacious spa-like bathroom with walk-in shower. The Residence Inn suites are designed for a comfortable extended stay. Some of the features include spacious rooms offering zones for working, relaxing, eating, and sleeping. In addition, every suite features a fully equipped kitchen with a refrigerator, stove, microwave, and coffeemaker as well as a large bathroom with a six-foot walk-in shower. The property also contains a Dynamic Architectural Façade (DAF). 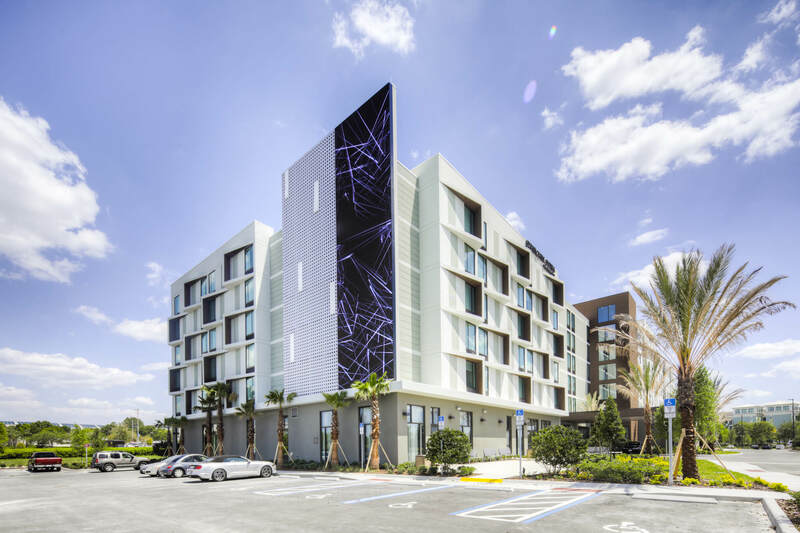 This innovative digital façade is the first of its kind in Orlando. There is a significant trend in growing urban areas to include integrated digital graphics on building’s exterior façade. This DAF allows digital art images to be displayed in a very slow and undulating motion across the hotel’s exterior.